Rupert Pupkin Speaks: Kino Lorber Studio Classics - WITNESS FOR THE PROSECUTION & THE PRIVATELIFE OF SHERLOCK HOLMES on Blu-ray ""
Billy Wilder was a filmmaker who had a tremendous impact on me when I was younger and starting to get into cinema in a much more serious and academic way. Wilder and Howard Hawks were and are two of my favorites to this very day. I studied film in college and it was right around the time that I dedicated myself to that path that I started to discover Wilder's remarkable body of work. I saw DOUBLE INDEMNITY and the APARTMENT and I was immediately obsessed and have never stopped loving his movies. 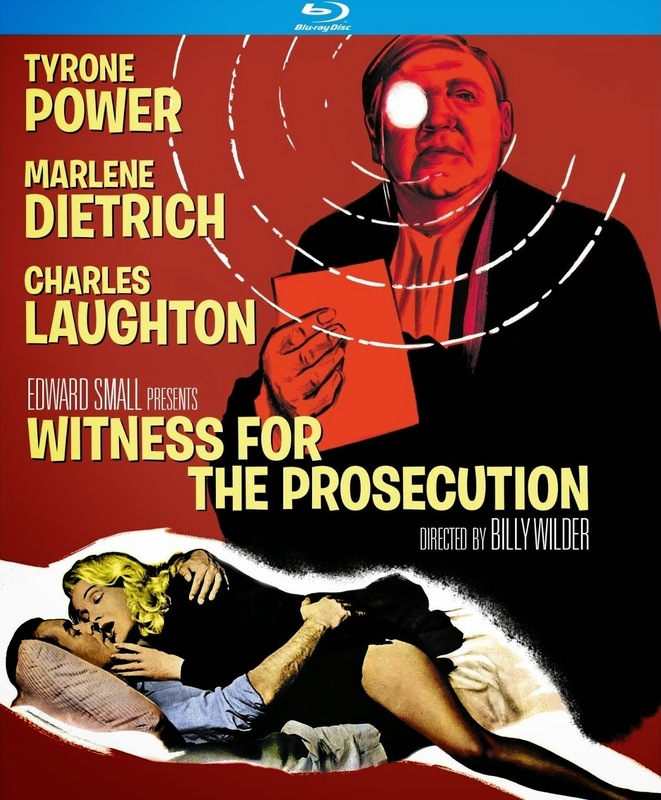 That being said, for some reason I had never gotten to see WITNESS FOR THE PROSECUTION. The courtroom drama is a genre that's all but disappeared from contemporary cinema. Even an academy award powerhouse like A FEW GOOD MEN is all but forgotten today, especially as far as it having an influence on contemporary movies. Though it may sound like an inherently unexciting (an perhaps uncinematic) atmosphere to some folks, the really great courtroom dramas can be remarkably compelling and engaging. One of the great things about directors like Billy Wilder (and Hawks for that matter) is this remarkably ability to work so well inside of a variety of different genres. Just when you think you have him pegged as a comedy kinda guy, along comes a searing cynical yet powerful portrait like ACE IN THE HOLE or a tense war film like FIVE GRAVES TO CAIRO. Wilder is just a master director so it is no real surprise to see him move so deftly between these different types of movies. 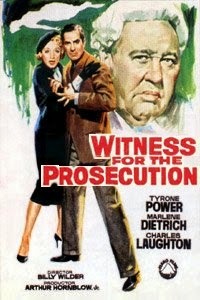 In WITNESS, Tyrone Power plays an inventor type who, after befriending a rich spinster widow, is accused of her murder. He has little in the way of a proper alibi, so he's put in touch with a veteran barrister (Charles Laughton) to help assist him with his defense. Wilder and a few co-writers based their script on a short story (and later a play) by Agatha Christie, so you know the source material offers a sound foundation upon which Wilder can work his cinematic magic. Wilder is aided by some stellar performances from Charles Laughton and Marlene Dietrich. Laughton disappears into this old grump of a barrister so perfectly it makes you wonder how much of that could have really been him and what he was like at times. Especially when we get to the courtroom scenes, Laughton absolutely eviscerates not only the other characters with his legal prowess, but also the other actors with his ability to make it all look so easy. Dietrich's performance is a bit more layered in that it is one of those "acting inside of acting" kind of scenarios. I have a feeling I will come to appreciate it more upon further viewings of the film (as is often the case with something like this). This disc includes a nice interview with the late great Wilder himself, conducted by director Volker Schlondorff. It's in German (with English subtitles) and it is intriguing to hear Wilder speak German if you've never seen him speak it before. The interview (actually a mix of a few interviews) runs about 6 mins or so and within it Wilder discusses Agatha Christie (versus Raymond Chandler), how Marlene Dietrich brought him the project and story construction in general. Very enjoyable stuff. It's always educational to listen to Billy Wilder talk about his process and this short segment is no exception. At the opening THE PRIVATE LIFE OF SHERLOCK HOLMES, the credits roll over shots of a safety deposit box belonging to Dr. Watson being opened (and as Watson's voice over tells us, fifty years after his death). Watson recites the beginning of the accompanying letter and starts to describe the scenario we 're about to see unfold. He mentions many of Holmes' most renowned cases and goes on to say that this memoir will be different than the tales of Holmes we are accustomed to. We are let in on the fact that this story may be a bit more sordid and certainly will act to deconstruct the exaggerated persona of Holmes we've come to believe to be true. Addressed are things like Holmes' habitual cocaine use, his musical prowess and even his sexual orientation. This incarnation of Holmes (played deftly by Robert Stephens) also plays fast and loose with ethical conduct and is not above breaking and entering , grave robbing and other questionable practices. This isn't to say any of these things make him a less interesting Holmes. On the contrary, he is quite entertaining. The script for the film, written by Billy Wilder and his longtime partner scribe I.A.L. Diamond, poses the perhaps inevitable but not often addressed idea that at some point, a mind such as Holmes' may encounter everyday boredom. It stands to reason that such a mind would, when not occupied with a challenging case, get caught up in a certain ennui especially after having solved so many remarkably memorable and difficult cases. This particular case starts with an amnesiac woman being dropped on the Baker Street doorstep of Holmes and Watson. The gents are tasked with finding her missing husband and said quest leads them through many intriguing twists and turns (one of them involving the Loch Ness monster). The somewhat conspiratorial plot hints more at the 70s paranoid cinema of someone like Alan Pakula (if in a bit more playful way) than many of the more well known Sherlock tales whilst still carrying an sir of classic Hollywood that only a fellow like Wilder can bring. Tonally, Wilder's film seems to fall somewhere on the mystery spectrum between Pakula and SCOOBY DOO (and I mean that with the utmost affection). Robert Stephens obviously has some big (and oft worn) shoes to fill, but nonetheless he fills them well. Though Wilder and Diamond's script doesn't quite pack the dialogue punch of their earlier efforts, it is obviously still well written and structured. Part of me wants to credit the somewhat less punchy and passionate character exchanges to the fact that Wilder and Diamond are having to write for existing characters as opposed to those they've created themselves. High points overall include Christopher Lee in the role of Holmes' brother Mycroft (Lee played Sherlock himself a few times as well) and the general interplay between Holmes and Watson (played by Colin Blakely). The Holmes/Watson relationship is much more lively and fun here than in previous filmic versions and that is a quite welcome thing indeed. 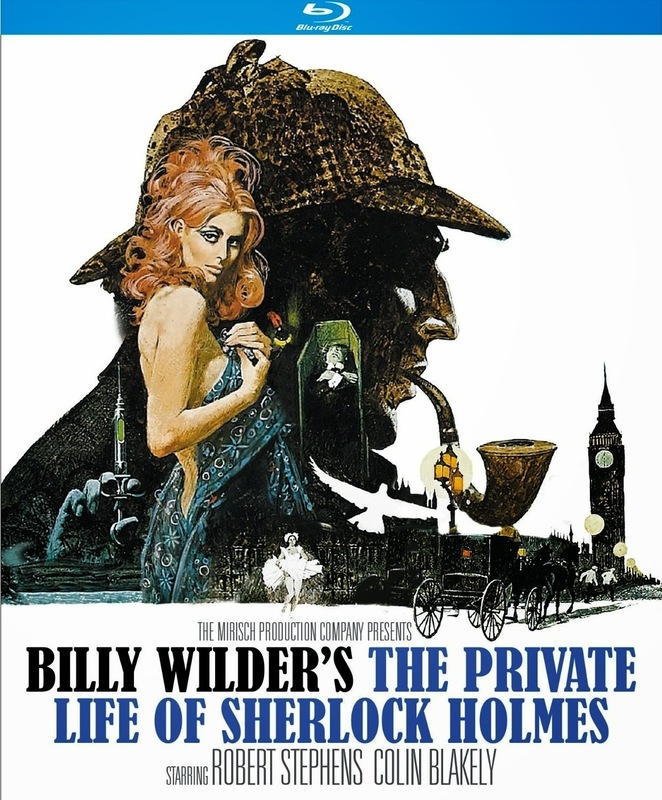 THE PRIVATE LIFE OF SHERLOCK HOLMES as a film (in the version we now see here) has a touch of bittersweet to it in that apparently Billy Wilder had conceived it as at least a three hour affair (if not a bit more) based on the original script and United Artists ended up cutting it down to just about two hours in the end. The additional footage shot for the film seems to have been lost, but we can always hold out hope that someday it will perhaps be found. This is not a MAGNIFICENT AMBERSONS level tragedy, but unfortunate nonetheless. The film that remains is quite good though and worth watching most assuredly. -"Christopher Lee: Mr. Holmes, Mr. Wilder" (15 mins) This wonderful interview with the legendary Christopher Lee begins with him gracefully mentioning all the talented directors he's had the pleasure of working with and succinctly stating that his experience with Billy Wilder on this film was a singular, career-changing experience. As you might expect, this chat with Lee is thoroughly entertaining and absolutely mesmerizing. An actor of his vast experience (his imdb page lists 280 credits currently), skill and intelligence cannot help but be memorable and engaging in conversation. Walter is a very affable, pipe smoking chap and after introducing his career (which started in in WWII and that led to him working for MGM). His career is quite profound and includes outstanding films like THE HAUNTING, DARK OF THE SUN, CHILDREN OF THE DAMNED, EYE OF THE DEVIL, OPERATION CROSSBOW and 10 RILLINGTON PALCE. He has a lot of recollections about THE PRIVATE LIFE OF SHERLOCK HOLMES including things like I.A.L. Diamond often calling "cut" on the set (as opposed to Wilder) if any dialogue from the script was not spoken absolutely correctly. He also discusses the fact that the original cut of the film between 3 and 4 hours and what had to be taken out to get it down to time. A very pleasant, informative interview indeed. As mentioned in the Ernest Walter interview, the film was cut significantly. Some of said cuts basically consisted the lifting of entire cases (there were a few more originally covered in the film). Unfortunately, these scenes are only included here in the form of script pages, stills and a small smattering of audio. For the last deleted sequence, "The Dreadful Business of the Naked Honeymooners", the visual elements are there (and cut together) but no audio is included and the whole thing is subtitled. There is also a deleted Epilogue scene included on the disc, similarly covered with stills and audio.